Transparency Market Research (TMR) has published a new report titled, “Smart Implantable Pumps Market - Global Industry Analysis, Size, Share, Growth, Trends, and Forecast, 2019–2027”. 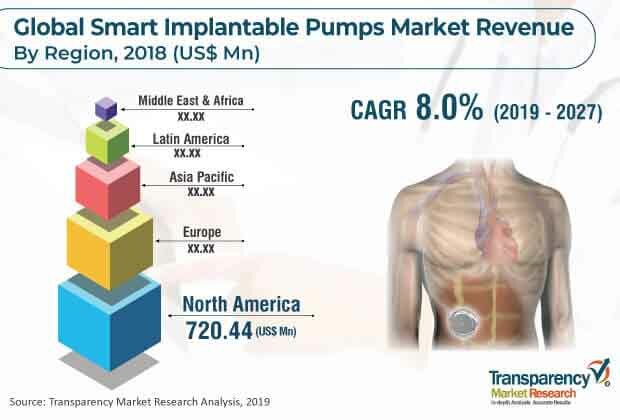 According to the report, the global smart implantable pumps market was valued at US$ 1,332.42 Mn in 2018 and is projected to expand at a CAGR of 8.0% during forecast period from 2019 to 2027. The global market is anticipated to be driven by technological advancements and increase in usage of smart implantable pumps during the forecast period. The market in Asia Pacific is expected to expand at a high CAGR due to high prevalence of diseases, improvement in health care infrastructure, and rise in adoption of smart implantable pumps. Smart implantable pumps have several advantages over conventional delivery systems (syringes/pens/injections). Smart implantable pumps provide site specific drug delivery, minimize potential side effects, and help improve the quality of life. Moreover, these pumps are patient compliant, as the treatment regimen associated with a smart implantable device is generally less burdensome than pills or injections. These advantages over conventional delivery systems are projected to drive the global smart implantable pumps market in the near future. Rise in prevalence of chronic pain, heart failure, and hypertension is a major driver of the global smart implantable pumps market, as these pumps are extensively used to administer drugs during the treatment of these diseases. Heart failure is a major public health problem, with a prevalence of over 5.8 million in the U.S., and over 23 million globally. A number of international studies have estimated that between 10.1% and 55.2% of the population is afflicted with pain. In the U.S., 20% to 30% of the general population experiences chronic or recurring pain. Approximately, two thirds of these people have had pain for more than five years. Hence, rise in prevalence of chronic diseases is likely to propel the global market in the near future. In terms of type, the smart implantable pumps market can be divided into perfusion pumps and micro-pumps. The perfusion pumps segment is projected to account for leading share of the global market during the forecast period owing to wide adoption of these devices, especially Medtronic’s Synchromed II Pump. Technological developments in perfusion pumps are anticipated to boost the growth of the segment during the forecast period. Based on application, the market can be bifurcated into pain & spasticity and cardiovascular. In terms of end-user, the global smart implantable pumps market can be classified into hospitals, ambulatory surgical centers, and others. The hospitals segment is expected to expand at a high CAGR during the forecast period due to increase in the number of visits and longer stay in hospitals, favorable reimbursement policies, and rise in the number of implantable procedures performed in these settings. Geographically, the global smart implantable pumps market has been segmented into five major regions: North America, Europe, Asia Pacific, Latin America, and Middle East & Africa. North America is projected to constitute leading share of the global market during the forecast period, owing to high adoption of smart implantable pumps and high health care expenditure. Europe is anticipated to account for significant share of the global market between 2019 and 2027. Increase in incidence of chronic pain and pulmonary arterial hypertension is expected to propel the market in the region during the forecast period. The market in Asia Pacific is likely to witness strong growth during the forecast period, due to surge in health care expenditure. Moreover, increase in focus of key players on expansion in the region, large untapped population, and rise in awareness about smart implantable pumps contribute to the growth of the market in Asia Pacific. The smart implantable pumps market in Latin America is anticipated to experience steady growth from 2019 to 2027. Key players profiled in this report are Medtronic, plc. Tricumed Medizintechnik GmbH, Flowonix Medical, Inc., Abbott, Intarcia Therapeutics, Inc., Cognos Therapeutics, Inc., and Berlin Heart, among others. These companies focus on strategic collaborations to develop new drug-device combination for better treatment outcomes.